Kralendijk Bonaire - 11 october 2012. New arrival just fresh on the Island. We are pleased to introduce I Love Bonaire silicone bracelets deluxe. High quality and great styled special for the I Love Bonaire Friends. We can inform you they were flown in especially for the last days of the Regatta Bonaire. LIMITED STOCK!!!! what you see is what we have in stock. Sizes are 20cm and 21cm diameter for the Ladies and gents. 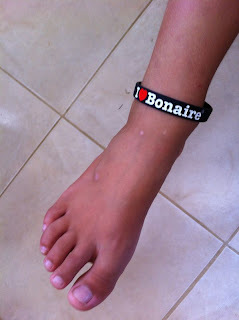 Especially designed and produced for I Love Bonaire exclusive the extra large size 24 cm for the I Love Bonaire Giants. Get yours before we are out of stock. Great Idea just as an Ankle band.